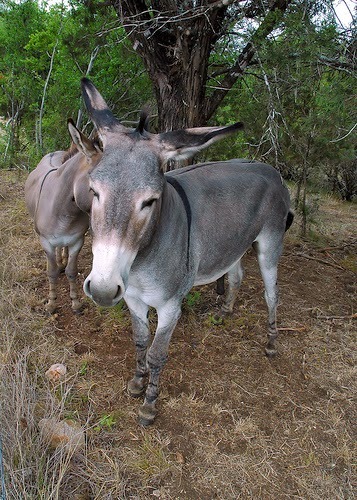 I sure don't want to be "one of Jesus' jackasses,"
but this guy's kind of cute! I found this article "Why does Jesus Turn Decent People into Jackasses?" a little while back and it's stuck with me, so I thought I'd share it with you. Makes me more determined to ensure that my communication, particularly in interfaith situations, is as clear, loving, and un-jackass-ish as possible. "How a relationship with Jesus affects people seems to vary a good bit. Because as much as Jesus brings some people hope, healing, and resurrection, that same Jesus also makes some people turn into intolerant name-calling Christians who seem downright entitled to utilize the Bible as a device to be mean and hateful. If engaging scripture and prayer and going to church makes us act like nasty, self-righteous jackasses, we’ve completely missed the point." A few months ago the story about Davion Only caught my eye and touched my heart. A foster child since his birth to a woman incarcerated for petty theft, he had bounced around to dozens of different homes in his 15 years. One Sunday last fall, he bravely stood before a congregation at a church in Florida to ask for a family, for people to love him. I was thrilled to read this story on Christmas Eve. Davion spent Christmas with a potential adoptive family. I hope and pray all goes well and he's found his permanent home. Thinking of the thousands of other children like Davion, I stand in awe of those who open their homes to be foster parents. Just about everybody has already done that dialect map that was making the rounds on facebook, but in case you didn't have a chance, go here, answer a few questions and see what areas of the United States most closely match your speech patterns. I took the quiz probably a dozen times trying to get a result that made sense (the quiz only gives you 25 questions, but there's a bank of more than that, so your results will change a little each time). I figured I'd show up as a mish-mash of different areas because I've lived in Florida, Hawaii, Northern Virginia, southern Virginia, Utah, and Washington. My result maps were always almost completely red, with a light blue area in New England, which indicated that my speech patterns are pretty non-identifiable across most of the U.S.. The weird part was that it kept coming up with "most similar cities" in northern California, Louisiana, or Texas, and once in Lincoln, Nebraska, which makes absolutely no sense at all. I've never lived in any of those places, never even visited most of them, don't have family there. Weird. Everyone else seemed to get results that made sense, though, so have fun with it! Here's another map for your viewing pleasure. This one uses certain statistics as markers for the seven deadly sins: wrath, envy, gluttony, greed, lust, sloth, and pride. Not sure how much I agree with some of the markers they chose, particularly sloth, but it's certainly interesting. My current home region seems to be pretty average across the board, with higher-than-average problems with envy and lower-than-average problems with lust. How's yours? That speech survey made me laugh. Apparently my three most similar cities are Spokane, Portland, and Salt Lake, two of which I've lived in and one lived near.